Radical English is a mastermind group of experienced, professional EFL/ESL teachers based in Canada, Hungary, Portugal, the UK and the USA. We publish, give webinars, do podcasts and live webinars, talk at conferences and seminars, teach students and clients, and train teachers on our unique approaches to teaching and learning English. Each of us has an area of expertise that we actively pursue and are passionate about, one that is radical in nature and a departure from the traditional. Formed in 2012, the Radical English group consistently sparks new ideas, generates new approaches and improves old methodologies, and we are always looking for ways to share these with the world. We teach actively and are engaged with universities, businesses, private schools, and organizations to improve English teaching and learning worldwide. We continue to expand and develop our areas of interest and expertise in ESL/EFL - technology, English for children, business english, ESOL, EIL, public speaking, pronunciation, language immersion...areas of expertise and interests can be found by clicking on the links above. Contact us for a conversation about how to improve or initiate your course, curriculum, program, or English teaching and learning in general. Explore our Radical English website, and visit our individual sites to learn more about what we each have to offer. If you’d like to be kept up to date on Radical English plans and events, check in to our homepage and blog posts. If you want to talk further with one of us about an English teaching or learning need, please contact us individually. Thanks, we’re glad you came to visit! 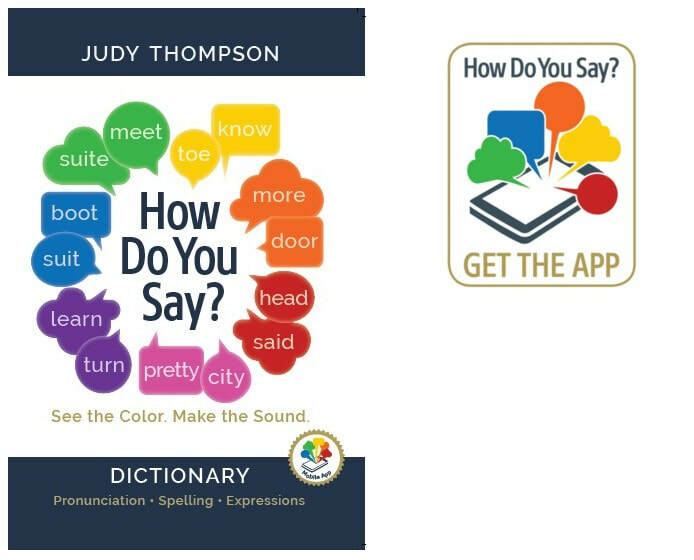 The fabulous English learner resource for #Pronunciation, #Spelling and #Expressions is available for $19.95 US from Amazon. ​How Do You Say? was originally released in 2012 as Grass is Black. An awesome outcome of the Disruptive Education Conference in November 2018 was the creation of a formal group who identifies as the Language Coaching Association LCA. Who meets regularly and is planning the next Distruptive Education Conference for March 23 - 24 2019. Are you frustrated with the way English is taught today? Thinking about teaching online and don't know how to start? The #Disruptive #Education for #English#Language Professionals conference in Toronto Nov 3, 4 features James Rice - Edutech superstar, Elizabeth Verwey - small business guru, Anesh Daya - Experiential Learning expert and me Judy Thompson - Content Queen launching the Backpacker's Guide to Teaching English series! Swag includes the pronunciation, spelling and expressions dictionary How Do You Say? and the award-winning Study 'it' textbook! Thank you, thank you, thank you Radical English community for the feedback. You have chosen the cover for the new Pronunciation, Spelling and Expressions Dictionary for English Language Learners and here it is! The cover was the last detail we needed before publication. The book and app will be released in October and available to purchase at the Disruptive Education Conference November 3 and online. It's happening! 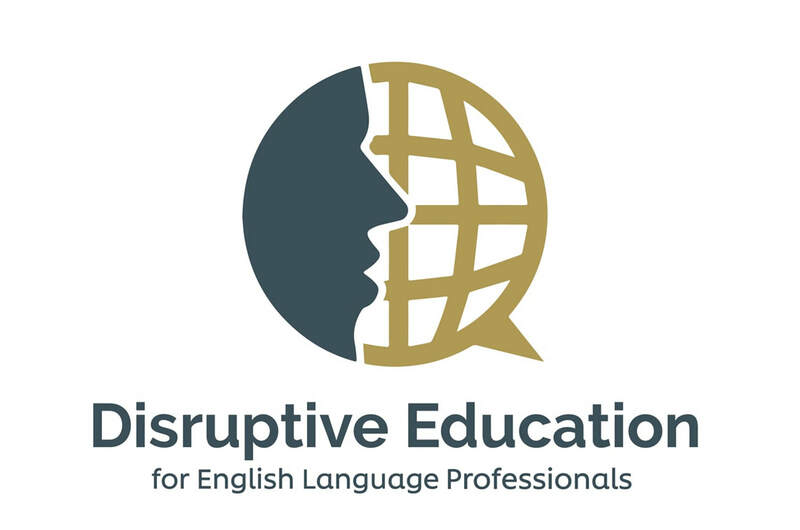 The first Disruptive Education for English Language Learners Conference is happening in Toronto at the Centre for Social Innovation on Bathurst St. Watch this site for more information as it becomes available. Judy Thompson is the guest speaker this month at The Probus Club of Etobicoke. With English as the global lingua franca Native English speakers have been a bit uppity about their native tongue. However, 1.5 billion Non-native English speakers have put enough pressure on 'our language' to change it. Now it is English speakers who have to do the changing. We don't like it. The Backpacker's Guide to Teaching English is written and in the hands of editors, designers and publishers, to be released in September 2018. Circumstances turn travelers, volunteers and refugee hosts into English teachers the industry calls Backpackers. With no formal training casual teachers want to know the best way to help learners with their English speaking goals. Now they know. 100 families in Peterborough, Ontario took Syrian refugee families into their homes. With no special language training these warm-hearted Canadians had no idea how to help their charges learn to speak English. 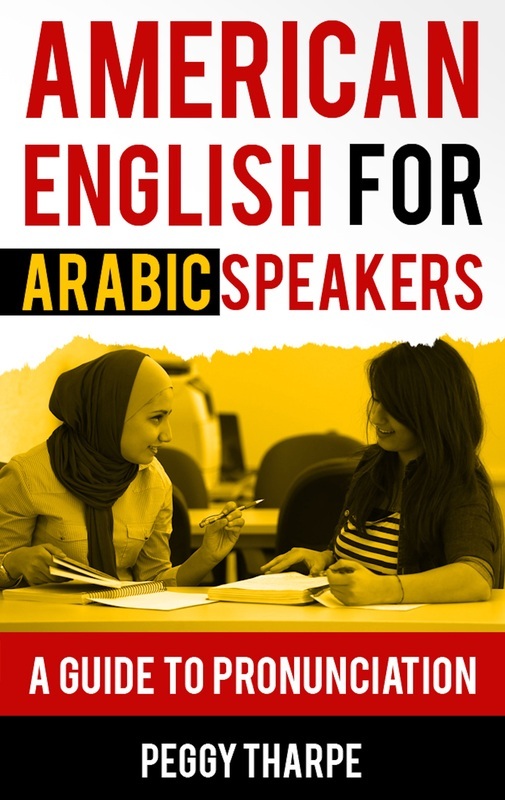 In a three-hour workshop Judy Thompson showed them the the basic patterns of English and how to harvest what is the same between English and Arabic to teach the newcomers to speak English quickly and fearlessly. 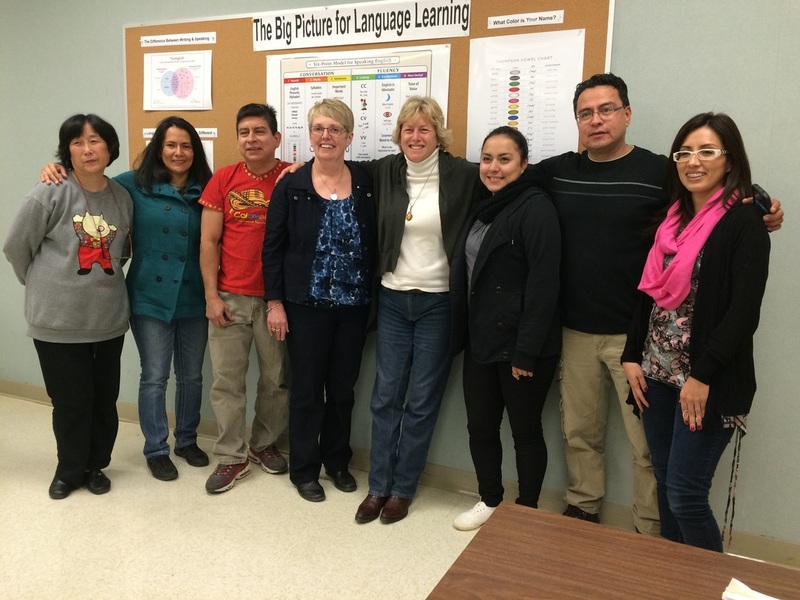 Judy Thompson enjoyed a return trip to SaskTech in Regina to train that great group of teachers in finding and using what is the same about English and any other first language in order to facilitate teaching and learning Spoken English faster and with more confidence. 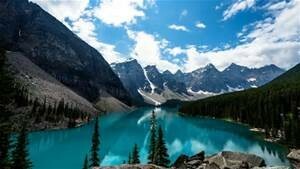 May 26, 27, 2017 Judy's Pronunciation Workshop for Saskatchewan Polytechnical Institute. What a progressive organization and a fabulous group of teachers! May 1-14, 2017 Lydbury English Centre. 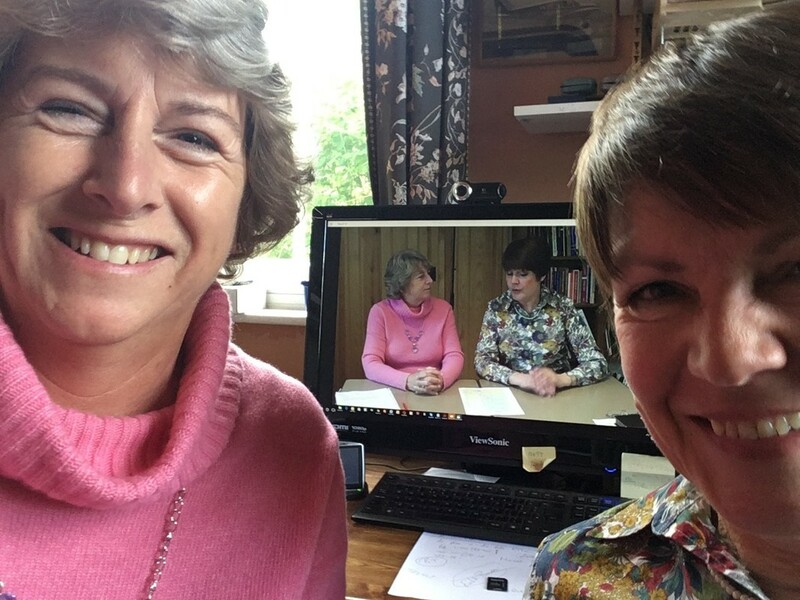 I was thrilled to work with Rita Baker to record her Global Approach on video, soon to be release for the whole world. April 28, 2017 Teresa Almeida d'Eça gave a presentation titled Pronunciation Made Easy at the 31st Annual APPI Conference in Lisbon, Portugal. 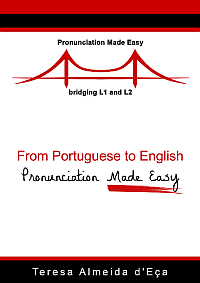 It's about her pronunciation strategy that uses the L1 (Portuguese) to help pronounce the L2 (English). April 24, 2017 Teresa Almeida d'Eça launched version 3 of her sound e-dictionary, From Portuguese to English: Pronunciation Made Easy. 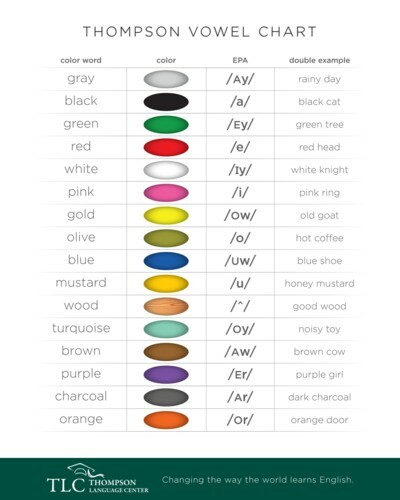 It includes a significant change: the sounds are divided into syllables and the stressed syllable is in bold. This makes all the difference in a stress-based language such as English. There's also a new cover. Do visit the website. ​March 2017 Keystone English my new website is taking shape. Cracking the Code of English is a free eBook I'll offer to introduce students to a simple system for learning English quickly using first language. In this course, Peggy demonstrates how she teaches English vowels to anyone, of any age, and any level of English study. April 20, 2016 Judy Thompson for TESL Toronto, Alternative Income Streams It was a fun evening and a great event for ESL Teachers looking to create or add extra income. Language and Content Integration for Young English Learners. 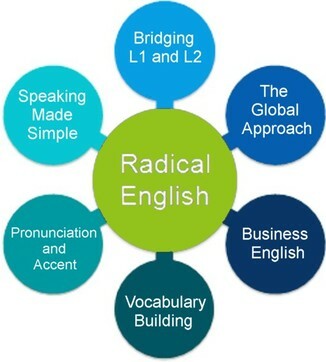 Apr 13, 2016 It's time for a radically different approach to presenting English.Rita Baker (Lydbury English Centre). What to teach, and how? 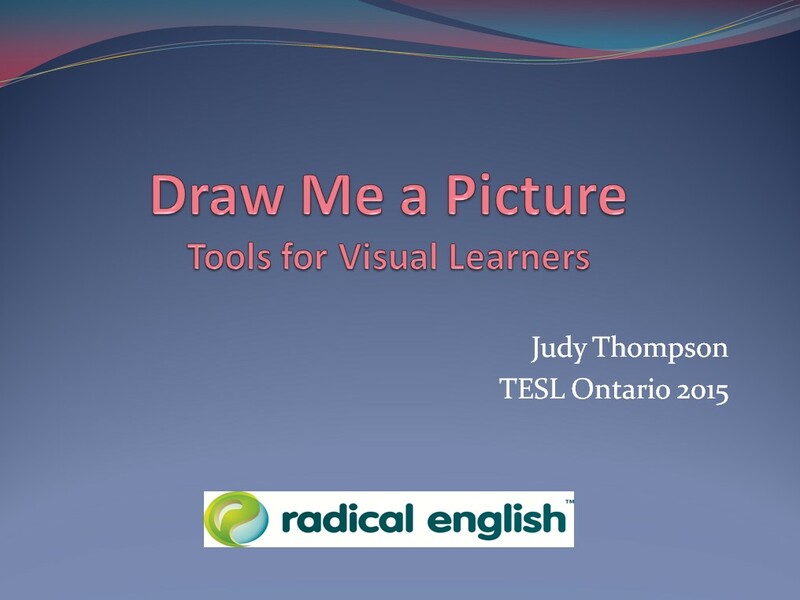 Draw Me a Picture was a popular presentation at TESL Canada and TESL Ontario in 2015 and it is back as a Tutela hosted webinar. 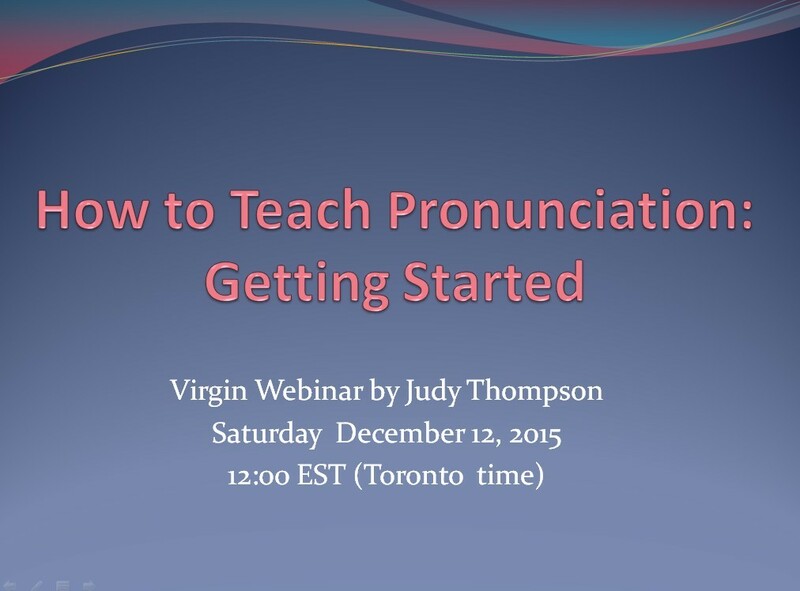 Judy Thompson's first webinar on teaching Pronunciation aired and the link for the recording is here: How to Teach Pronunciation: Getting Started. "I have just listen to your webinar which I found extremely interesting and helpful. I am a great believer in using visual aids in teaching. ​This was one of the best webinars I have watched." "Had tears … from student They were tears of empowerment, joy, relaxation, confidence, and yes, transformation.Thanks for all you do for us, for your mentoring and for trying new things for us." History of English/ Vennglish /Old Friends. 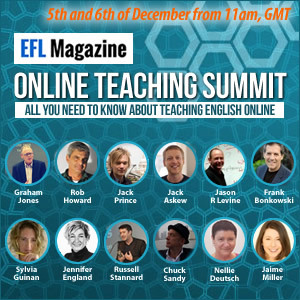 Jennifer England of Radical English presents at the ONLINE TEACHING SUMMIT sponsored by EFL Magazine. Nov. 2015 Peggy Tharpe published teaching materials used with advanced Japanese clients to help improve their comprehensibility. July 31, 2015 Teresa Almeida d'Eça launched version 2 of her sound e-dictionary, Pronunciation Made Easy, which bridges Portuguese (L1) and English (L2). It includes a new cover and a list of regular verbs and their three different endings. March 15, 2015 Peggy Tharpe published the second e-guide in her series The Art of Teaching Pronunciation: American English Pronunciation for Japanese Speakers. This is Part 1: Teaching Vowels and Consonants Effectively. March 11, 2015 Teresa Almeida d'Eça published the article, Google A World of Apps, in the TESOL CALL-IS March 2015 newsletter. March 4, 2015 Judy Thompson published an article in TESL Contact magazine Spring issue Teaching Speaking Online. January 4, 2015 Teresa A. d'Eça gave her Google Portugal Summit presentation titled "Google, a world within the World!" for the Webheads in Action. It took place in a Google Hangout on Air. You can watch the recording by clicking the image below. November 30, 2014 Teresa A. d'Eca will present at the first Google in Education Portugal Summit. Her presentation, titled "Google, a world within the World! ", is based on her use of Google apps at the personal and professional levels. You're welcome to view the presentation. 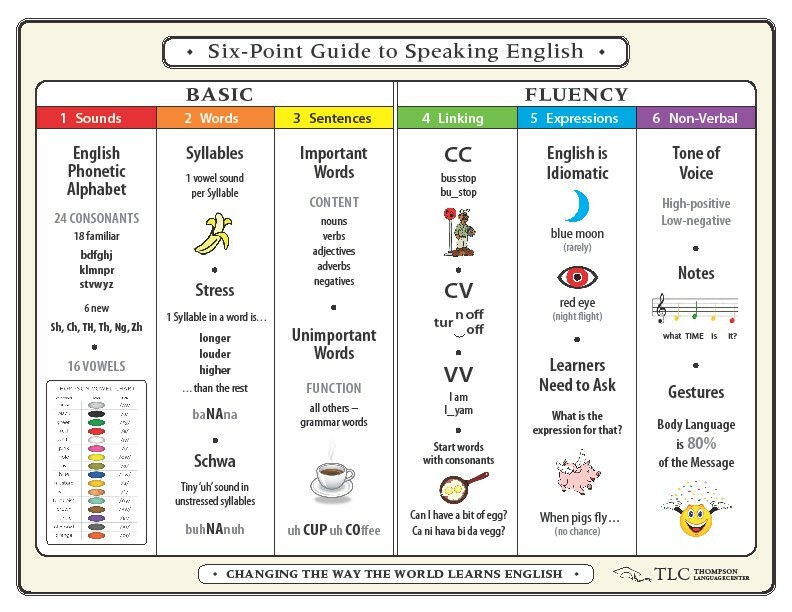 Thursday and Friday Poster sessions - The 6-Point Guide to Speaking English -above. I so enjoyed this wonderful event! October 15, 2014 An afternoon of fun and learning at a teacher training workshop for Centennial College, Toronto. September 6, 2014 Pronunciation Made Easy for Portuguese-speakers of English, a dictionary with the Portuguese sounds of 3.500 English words, was published today by Teresa A. d'Eca. Sample it for free before you buy it. Thompson Language Center worked with settlement services in Brampton to solve a big problem for all newcomers – talking on the telephone. Hundreds of helpful surveys were collected and all participants received a FREE copy of English is Stupid, Students are Not. Similar events planned in Toronto, London and Mississauga. RADICAL ENGLISH now has a Facebook page, and it's open to all. We invite you to join the conversation about what makes GREAT TEACHING AND LEARNING. Just click the bar below and tell us. If you are excited to learn a new system for spoken English this ﻿SUMMER SALE﻿ is for you. 'English is Stupid' is now used in 42 countries. You can see what the excitement is about for only 10$@ plus shipping. While they last! June 27- July 1 Book Sale for Arabic Speakers! Rita Baker published BRAIN POWER as a fore runner to her Global Approach. A layman's understanding of how the brain seeks patterns to learn sets the stage for effective classroom techniques in any subject. http://amzn.to/1klbk6t The best $8 you will spend this year. May-June: Jennifer England is teaching her course 'Oratoria en Inglés', a BUSINESS ENGLISH course, at the University of Lleida. 9 April: Teresa A. d'Eca is giving a webcast presentation about E-PUBLISHING for PFUR (People's Friendship University of Russia) in Moscow. Read more in the blog.